Necessity is the mother of invention, they say. With the release of NexGen back in the late 90s, we also released a companion product to help convert audio files, specifically mp3 for the most part, to NexGen’s native MPEG1 LayerII format. 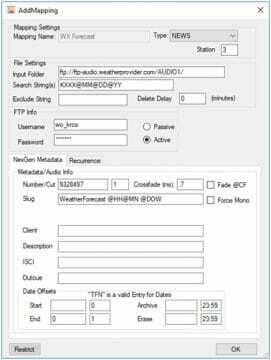 That product was called AFC (Audio Format Converter), and it had 8 file folder groups; it could look for inbound audio, you could apply a “dat template” to a folder and have it create metadata to go along with the audio for loading into NexGen. Fast forward a couple years to when I personally wanted to learn .NET programming, we had some clients that were constricted by this 8 folder group thing, and needed more. So I tinkered with a writing something that could “launch” AFC and expanded the AFC Group concept to a much larger number. Not too longer after that, we expanded the number of groups in AFC and the program became unnecessary. But what I noticed when I was developing it, was that that groups were being used to singularly load certain recurring events into NexGen. So an entire “group” was being used for the weather forecast for example. So I took what I started with, and created a new version of AFC Launcher, which introduced the concept of “Mappings”. 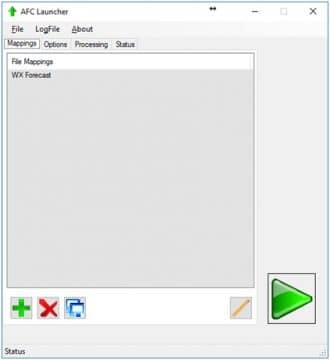 A mapping allows you to set nearly all of the NexGen fields, the NexGen audio type, relative start, end, archive and erase dates, and even customize the title to reflect the date and time that the audio came in. While originally leveraging NexGen’s Autoload folder system, I later adapted it to have an option to feed NexGen’s “Wancast” transfer system. I’m using this space today not to toot my own horn, but just to raise awareness of this helpful tool. It is a free download from the RCS downloads page at RCSworks.com (you must sign in using your rcsworks credentials), and only requires a licensed copy of AFC on the same machine. From there you can create as many as the mappings as you like, hour restrict the downloads to only happen in certain hours, and much much more. It is not officially an RCS product, but our support staff know quite a bit about it and can help. Last year, I also added a Zetta option, which bypasses the need for AFC at all and functions as an automated FTP download tool that adds custom metadata for each download. While Zetta already does have native FTP downloading capability, we haven’t yet added the metadata portion. If you find a need for this, please do feel free to download it and give it a try. You can find other users of AFC Launcher at our forums at www.rcscommunity.com.